Well, maybe it’s not a #1 Best Seller, but I’m pretty proud of it. 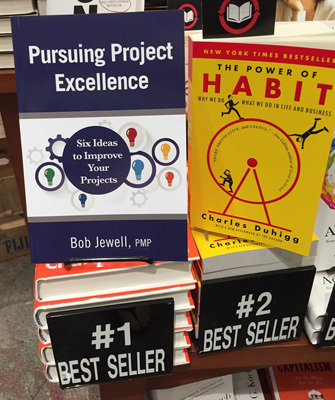 Pursuing Project Excellence: Six Ideas to Improve Your Projects started as an idea back in 2011 and was finished and published by Amazon in March 2016. The inspiration for the book came from individuals and clients who, over the past 19 years, have asked for my help with managing their projects either by coming to one of my classes or hiring me as a consultant. The six ideas presented in the book have all been tested, honed, and proven both in the classroom and, more importantly, in the field. I considered writing additional chapters, but I think there are too many “thick” project management books and we all know project managers don’t have time to read. So, I hope you can find the time for a quick read (54 pages). And to the over 1,400 (as of Jan. 2019) of you who have purchased a copy of the book since March 2016 – THANK YOU! I’ve been asked by a number of groups to speak or present workshops on some of the ideas in the book. If your group (PMI chapters) is looking for an engaging presentation, click here for more information.